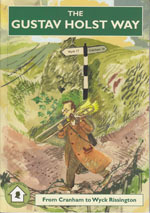 The Gustav Holst Way is a long distance walking route from Cranham to Wyck Rissington, via Cheltenham and Bourton-on-the-Water. Each place has close associations with the composer and the broad stretch of Cotswold country that connects these important milestones in Holst’s life and musical career was well known to him. He recorded many a pleasant day spent walking in the hills. From lofty Cranham village through extensive beech woods to pass along the Cotswold Edge, emerging on open, high ground with magnificent views, ending at Crickley Hill Country Park. From Crickley Hill Country Park along the Cotswold Edge to Leckhampton Hill, passing Devil’s Chimney, before descending on an old quarry incline to Cheltenham and finishing at Holst’s Birthplace Museum at Pittville. From Cheltenham to the north Cotswolds via the racecourse and Prestbury village; climb to the open common of Cleeve Hill; pass Belas Knap long barrow before descending through woods to rural Corndean Lane. The scenic highlight of the route, descending into the valley behind Sudeley Castle, climbing to the ancient ridgeway route of the Salt Way, passing commercial forestry and sweeping parkland to finish at the picture-postcard village of Guiting Power. From Guiting Power across open fields to the pretty village of Naunton, along the Windrush valley floor to Bourton-on-the-Water; through nature reserves and meadowland to Wyck Rissington.